Nothing is more frustrating or disappointing than having an exciting beach vacation planned and needing to cancel at the last minute for a crisis at work or family illness. Adding insult to injury is to find out that even though you didn’t step one foot in the sand, you are going to lose the entire amount you would have spent on lodging. But that could easily happen if you don’t read the fine print of your rental policy. The upfront charges and penalties vary greatly from rental management company to rental management company. So, we’ve put together some tips to help you identify “Guest Friendly” policies when deciding which company to book your family vacation through. The most obvious (and potentially costly) thing to look out for is the cancellation penalty. Unfriendly Guest Policy: Cancel within 30 days? Pay in full. Sadly, it is common to find a 30-day cancellation period with nearly all rental management companies and even rentals by owner. This means that if you cancel anytime within 30 days of your scheduled vacation, you pay the entire amount. Even if you cancel earlier than 30 days out, you are usually charged a $30 – $50 administrative fee. Guest Friendly Policy: Cancel more than 30 days in advance? No penalty or payment due. There are some management companies on the Gulf Coast that allow you to cancel within 30 days of your arrival date without penalty. Even if you have to cancel within a 30-day window, you only forfeit 50 percent of the total cost of your reservation instead of the full amount. Unfriendly Guest Policy: 30 percent due at booking. Unfriendly policies require a 30 percent deposit when you make the reservation even if you’re several months away from putting your toes in the sand. This means that you need a significant amount of money upfront for your family vacation. Guest Friendly Policy: $0 down when you book. The most guest friendly policies do not require a deposit at the time of booking, and only take a 50 percent deposit 30 days prior to your arrival date. This means that you can book well in advance without the risk of losing any money if you cancel more than 30 days prior to your vacation. Unfriendly Guest Policy: Pay in full a month before you stay. Final payment is due 30 days prior to arrival. Again, this means you are paying a significant amount of money before you ever get near the beach. If you cancel after you’ve made your final payment, you forfeit all of your money. Guest Friendly Policy: Final payment not due until arrival. 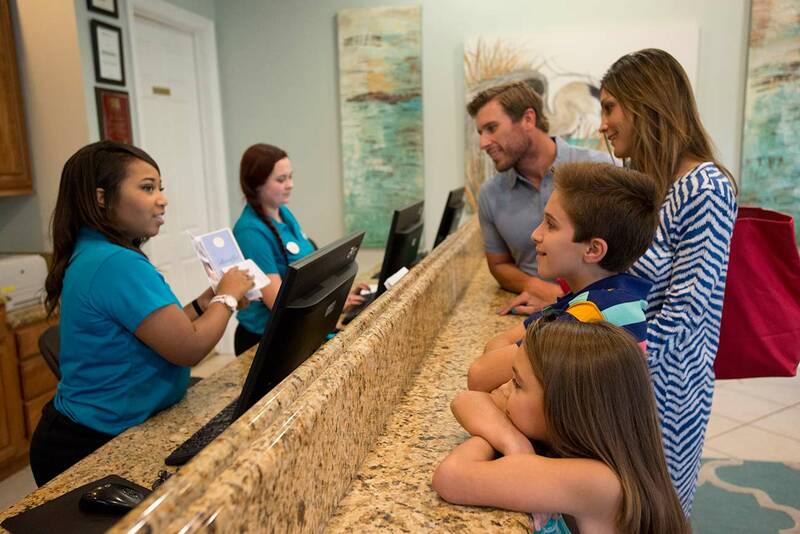 Guest friendly policies let make your final payment when you arrive. This means you put less down upfront and have more time to save up money for your vacation rental. Unfriendly Guest Policy: You book it, you get it. Unfortunately, many of us have had the experience of showing up on property and find out the room doesn’t exactly look like it did in the online pictures. Unfriendly policies usually mean that you’re stuck with that rental, even if it was misrepresented. Even if they can move you, many times you may wind having to relocate to a different property. Hint: make sure the company you rent through has plenty of rentals available at the property you choose in case you do need to be moved. Guest Friendly Policy: Not happy with your rental? Get relocated to a comparable vacation rental at the same resort no questions asked. A 100% Satisfaction Guarantee means that you can reserve your rental and be confident that if your room isn’t up to par you and your family will be taken care of. So make sure to pay close attention to the rental policies you agree to when reserving your beach vacation. You don’t want to wind up paying for a vacation you never get to enjoy!